I have not yet used WordPress as my own learning management system for my English courses, but I have been involved for the past 3 years in some collaborative projects on WordPress. 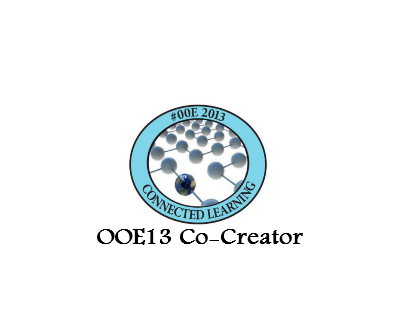 In 2013-2014, I collaborated with many others in the creation of an open and online technology integration PD experience which we called Open Online Experience 2013 #OOE13. We patterned the course topics and organization after the Education and Technology Mooc #etmooc – wanting to continue the #etmooc experience together and offering it over a longer time frame. We had been introduced to many new ideas related to creating the web in #etmooc in 2012: connectivist theories as they relate to open pedagogy, digital citizenship, Mozilla’s web literacies, DS106 digital storytelling, Mozilla’s open badging system, using social media platforms like G+ and Twitter, professionally. Even the idea of blogging professionally was new to me. These ideas and practices have spread widely and many original etmoocers continue periodic Twitter chats, Google hangouts and stay connected with each other through participation in various projects, undertakings, research on the web, and use the personal learning networks established 3 years ago. I learned technical skills through collaboration on the web using multiple platforms. I worked through WordPress content and organization issues, acted as writer and writing editor, logo, image and badge generator. My technical skills advanced as I observed others work through the WordPress technicalities such as plug-ins and feeds needed to run the connectivist Mooc. I am continuing the technical learning with my Digital Storytelling 106 experiences run on WordPress. Working through technical solutions can be very frustrating for me, so I find it very helpful to have the online support group members who can answer my questions, and sometimes I can assist with technical issues. I have certainly been able to take the lead in my own university department with teaching / learning online solutions based on my experiences with the connectivist and other Moocs I have taken in the past years. Last summer, I participated in a digital storytelling project with DS 106 on WordPress; a loosely based Burgeron family reunion storyline set the background for digital arts creation and writing. As a group , we tried to create a framework for the story initially, but once each character was established, the story seemed to take on a life of its own and the connectivist magic- or to use Dave Cormier’s term-the rhizomatic magic-happened! The group relied on the technical expertise of DS106 leaders behind the scenes, and in a spirit of fun and creation, we gained technical expertise using WordPress. Again, working through content and organization issues (pages, categories, tags, media uploads) enhanced our knowledge of using WordPress as a teaching / learning platform. We continue with the family reunion this summer on our WordPress site, spinning imaginative fairy tales and honing our technical skills. Here is a trailer for the summer festival which I made on IMovie. I plan to begin a content only WordPress site for my English courses this fall, relying on my university Moodle LMS for student assignment submissions due mostly to the restrictions of British Columbia’s Freedom of Information and Privacy Act. This entry was posted in Teaching on Wordpress. Bookmark the permalink. Great rundown all of the fantastic stuff you’ve done openly on WP! I do the same thing with WP and our university’s LMS as you suggest at the end: I use the open site mostly for posting content, and all the assignments are submitted via the LMS. However, someone at UBC has created a way for students to upload papers either just privately to me or to a small group of other students (and only to them (and me), not public at all). We are working to improve the beta version and then it will be made more widely available. I’d like to make it so that there is just one course site for students (they get a little confused sometimes with more than one), and I’d like it to be WP rather than the closed LMS. Actually, a number of profs here at UBC are using Gravity Forms for assignments. I haven’t tried doing so yet, but that’s one of my projects for this summer–to learn how and to test it out. In fact, that’s what I’ll be building for #TWP15: one or two assignments using Gravity Forms. Does KPU have Gravity Forms available? Unfortunately, it’s not free or even cheap, really.